"Hopkins respectfully profiles Kate Sessions, a pioneering horticulturalist who helped transform San Diego’s City Park from a barren waste into today’s lush, tree-filled Balboa Park.... Hopkins’ text presents Sessions’ achievements in simple language embodying Kate’s can-do spirit.... McElmurry’s gouache illustrations adopt a stylized, reductive approach.... The artist nicely conveys Kate’s life arc, from child among sequoias to elder on a tree-lined park path. An appealing treatment of an accomplished woman’s life." "Echoing Barbara Cooney’s Miss Rumphius in artistic style and theme, this picture book biography recalls the life and contributions of a horticulturist in the late 19th century. Kate Sessions populated San Diego’s landscape with not lupines but trees.... McElmurry’s (Mad About Plaid) naïve illustrations are packed with patterns, from the dusty brown houses Sessions views as she docks in San Diego to the teardrop and polka-dot motifs in the trees. Likewise, debut author Hopkins skillfully employs a pattern in his narrative, a catchy refrain that emphasizes Sessions’s can-do attitude.... Vignettes that include muddy handprints, labeled plant cell parts, and trees subtitled with their Latin names complement the larger gouache spreads, and a concluding note explains more about the inspirational spirit and work of a pioneering arborist." “For slightly older readers ready for a little history, Hopkins describes the magic wrought by the Tree Lady, a real Victorian-era woman named Kate Sessions, who transformed San Diego’s arid Balboa Park into a lush, tree-filled garden…. Hopkins includes a lot of facts in the story, but his clever repetition of the phrase “But Kate did” each time her success confound expectations adds rhythm and a predictable structure. Even children who find the details of Sessions’ life difficult to absorb are likely to be enchanted by the book’s appearance. McElmurry’s paintings combine stylized design elements with naturalistic details…the plants and trees are detailed and distinct but also simplified enough that their basic structures can be easily understood. * "Katherine Olivia Sessions was a real go-getter, becoming the first woman to graduate from the University of California with a science degree (1881) and transforming San Diego’s City Park from a dry, ugly hillside into a lush garden flourishing beneath a beautiful canopy of trees.... Hopkins writes in a light narrative style that makes this picture-book biography a great selection for a storytime with a nature-based theme, but it also contains good information for early report writers. The author utilizes variations of a positive, upbeat refrain–“but she did”–that kids will enjoy repeating. McElmurry’s artwork undergirds Hopkins’s writing with stylized beauty and a sense of joy. This is a wonderful tribute to a true champion of nature." "This picture-book biography of Katherine Olivia Sessions traces the nineteenthcentury horticulturist from curious child with an affinity for trees, to the first woman to graduate with a science degree from the University of California, to schoolteacher with a vision for a greener, cooler, shadier San Diego than the sun-scorched patch she viewed from her classroom window.... The lively text, with its frequent repetitions of “Kate did,” “she did,” they did,” etc., exudes an optimistic, can-do attitude that will make listeners feel they’re in the presence of a newfound hero. McElmurry’s paintings, which add a dash of playfulness to a folk-art style, convey both the possibilities of the bare orange landscape and the lushness and variety of Sessions’ mature plantings. An author’s note offers additional detail, but the main text handily describes how a scientist-turned-teacher-turned-activist created her leafy legacy well into the twentieth century." "A very useful read-aloud for a science lesson in ecology and conservation.... 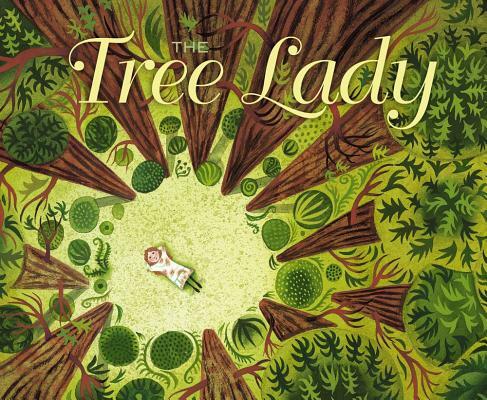 The Tree Lady is a worthwhile addition to any collection and is particularly useful in integrating science with literature and biography." "With an economical text and a spirited refrain, debut author H. Joseph Hopkins tells the story of boundary-breaking scientist Katherine Olivia Sessions.... The story is as much poetry as it is biography.... Kate broke the boundaries of what most women could do because of her passion for science, and for trees in particular. Her story will inspire children to follow their dreams."